I was driving and out of all days, car died on me today. I had no luck starting the engine. Since it was 11F today, thinking maybe bad battery, i tryed jumping the car still no luck. I ended up getting a pair of hands to push me, and while the car was moving i cranked the engine few times and finally got it going. Finally got home and read the codes. And hoping you guys can give me some idea whats going on. I tried starting the car few times after i got home and it starts every time. That said, the most recent thing i done to the car is put a can of Liqui Moly 2007 Jectron Gasoline Fuel Injection Cleaner in the gas tank. As just maintenance thing to keep the car in good shape. Not sure if this had anything to do with it or not, i would hope not. Also i had just under 1/4 of gas in the tank given that it was cold out i am not sure if may be fuel lines were frozen? What i am getting from the above codes is maybe bad fuel pump relay or bad fuel pump? But if that is the case how would my car run? And its running as i am writing this? I would replace fuel relay if thats the problem but i though i would get some feedback if any of you had similer codes/problems? Hm , can you check fuel pressure at the schrader valve? How many miles. The relay is much cheaper than the pump and easier. Could be good to do just because of age. When it’s not starting, can you hear the pump priming? I have not checked fuel pressure, where is shredder valve located? Car has 126K on it. I hope its the Fuel relay, as you said easier and cheaper to replace, but i will have to test it first to make sure its in fact bad. I ended up starting the car yesterday to warm it up, and i came back 10 min later and the engine was not running, so i am not driving it anywhere until i figure this out. If its a bad fuel pump why does it run sometimes? I was under the impression fuel pump ether works or does not, there is no in between but i am not sure? I will also check to see if i can hear it prime up on starting the car. If you have a coupe the relays are in the trunk on the passenger side. If a vert it's behind the rear passenger card. Maybe the fuel level might be the problem, the pump that pumps over the fuel from the left side of the tank to the right side(don't remember the correct name) might be bad so it is starving for gas. Put some gas in it and see what happens. Schrader valve is on the fuel press reg assembly under the car , driver side, about where the door meets the fender. Under a metal cover. Pumps can die slowly, but as stated, replace the fuel injection valve relay (green) and EKP relay black and test. No low voltage codes right? Update: I pulled the two Fuel Pump Relays out. I tested the green one and it working. I applied 12V to the two input pins and checked the connectivity on the output pins that would send the power to fuel pump and its working. I can hear the relay click as i energize it, and i can see the continuity established at that point on the output pins, which is what i would expect to see. That said the black one i need your help with. I did not see any circuit diagram for the black one, so i am not sure which pins need to be energized for it to work and which pins are providing the 12V to the fuel pump? I been googling but no luck finding any diagrams for it. The black relay has 8 pins, each has a number next to it, in this order 1, 2, 4, 5, 6, 7, 8. 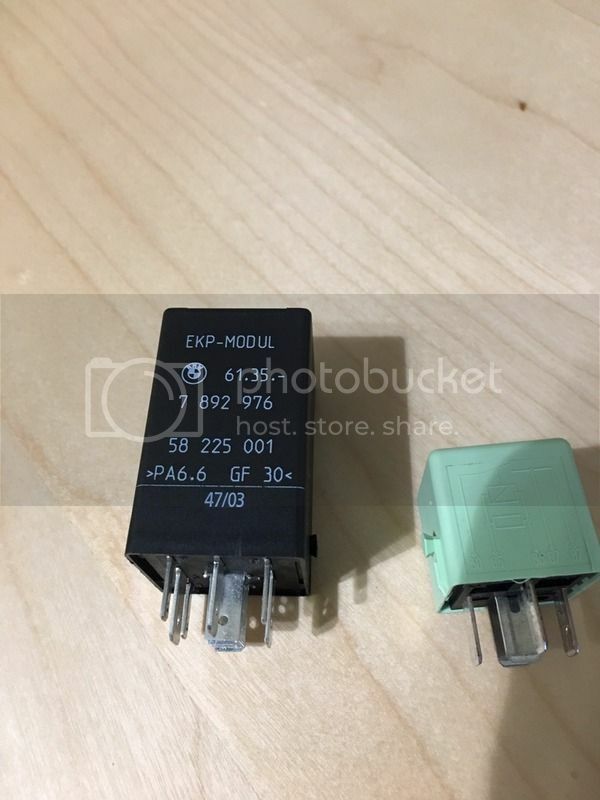 It was really cold today, i could not stay in the car to long to do more testing, but hope someone can shed some light on the black relay, and i can try to test it if its working or not. Here is the picture for reference on both black and green relay. Here’s the ETM of the Z3M (very similar to E46M) same DME / engine management. Save it, it comes in handy. Fuel pump might be on its way out. Usually it starts popping fuses before it goes though. Thanks for that diagram very helpful to understand. So here is a quick update, and unless i messed up my wiring i think the black relay is bad. Also note, i forgot to mention in above post, that there is one more pin 9 on black relay. But looking at that diagram you posted i dont see a reference for it, so maybe its irelevant but i though i would mention it here. All times are GMT. The time now is 10:24:33 PM.